Four photos ranging from approx. 3.5 x 5 inches to 3.75 x 3.5 inches. Top right is date-stamped Dec 59, with Nov 1959 / B.G. handwritten on the back. 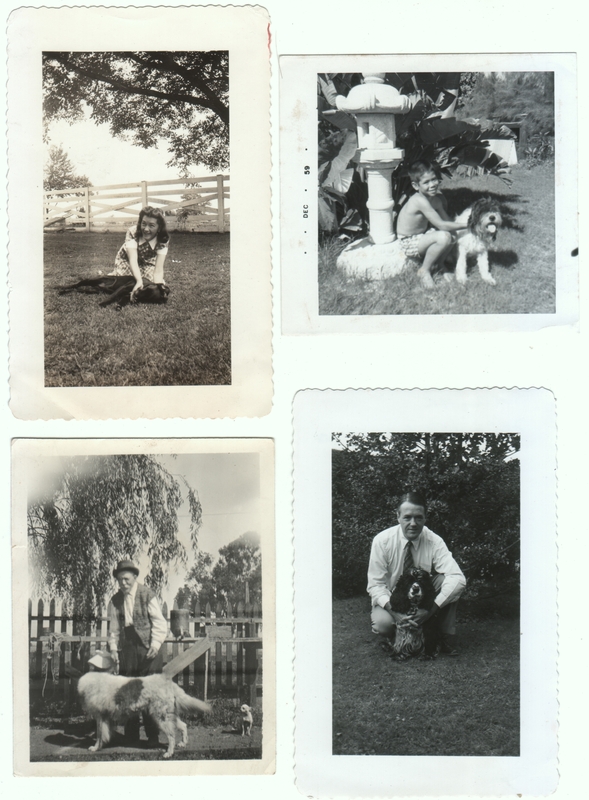 Bottom right has 16 Aug 1956 / Mat and Pache written on the back. My mother recently gave me a wonderful book of vintage photos of dogs. (Jenn and my other dog-loving readers, have you seen it?) I was just browsing through it again, and it inspired me to post some of my own. Hi Matt. It is a wonderful book, isn’t it? Just to let you know that these photos are linking to yesterday’s post, not to the enlarged version they’d normally link to. Or am I thinking of someone else’s blog? Thanks for all the “likes” on my blog this morning. I will get back to your comments asap. My favourite in this group is the old man, Chiuahua and big hairy galoot. Hi Katherine. Yes, I love the book. Thanks for the heads-up about clicking on the link, but it seems to be okay. One weird thing about this particular template is that if you click on the photo itself, it takes you to yesterday’s. So that’s why I’ve started adding a separate link in the body of the post to click to enlarge. Okay, Matt thanks for reminding me. I will now be able to see my favourite in more detail. Love the expression on the girl’s face! The bottom left photo strikes me as especially hilarious. Giant dog with no head, wearing a baby bonnet, with a teensy little dog at its rump! Yes, I have more than one photo of that dog, and he’s turning his head away in all of them, making him look headless. So strange. guess the pup was camera shy! I guess so, poor thing.